Eric and Quachee are both burger lovers! We've been to quite a number of burger joints to try out mainly for the burgers. When we first heard about the Korean burger revolution is happening in one of our favorite Korean restaurants - Bulgogi Brothers, the two of them just got excited and can't wait to try them out! 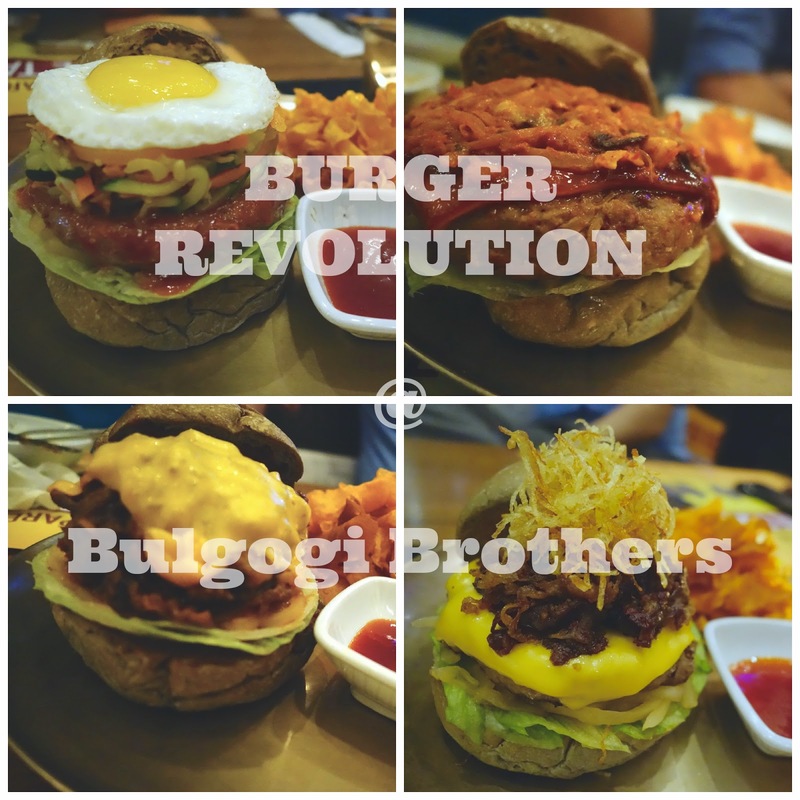 Bulgogi Brothers' Burger revolution is born from a simple idea which is to create an alternate way to enjoy bulgogi without compromising on the quality and flavors, whilst staying true to its Korean roots. Eventually, this idea gave birth to a movement - a taste revolution that transcends ordinary, traditional burgers with the use of authentic Korean ingredients and unique secret recipes in its Korean marinade and sauces. Having me in the group simply means they are going to start from the mild one first - Bibimbap Burger. It is inspired by Bibimbap, the popular Korean rice dish favorite comprises of sautéed vegetables, egg and sliced meat, Bulgogi Brothers has created Bibimbap burger, which features their home-made premium beef patty, topped with sprouts, carrots, zucchinis and to complete the stack of Bibimbap-inspired goodness, a sunny side up. I personally love Korean food and this Bibimbap Burger does taste like a real Bibimbap meal in burger form, minus the rice of course. The patty was soft, thick and juicy, it goes really well altogether! Here's the next one - Kimchi Burger - a not-to-be missed for every single Kimchi lover out there! It has quite a generous layer of lightly sautéed Kimchi, mushrooms and a perfectly seared handmade beef patty! Dayum, it was so good and pretty addictive, especially if you're also Kimchi lover like us! I felt so bad that I love this more compare to the previous one! Moving to the next level, which really tested my tolerance level of spiciness on that night was the Spicy Gwangyang Burger. It is named after a famous city in Korea, you're going to love and enjoy the fiery bite of tender sliced beef brisket, drenched in Bulgogi Brothers' spicy barbecue-like Osam sauce; garnished with button mushrooms and onions, along with slivers of melted American cheese. Though it is super spicy (to me), I somehow find myself enjoy eating it a lot! It has that kind of spicy and delicious sensation, tasty and addictive! MUST TRY! Last but not least, the fourth burger on the list - Unyang Burger. This is another of my favorite burger of the night for it has the highest pile of meat of all! No one can possibly say no to a hefty delight of homemade premium beef patty, layered with American cheese, beef brisket with savory sauce and beautifully garnished with crispy shredded potato sandwiched in a toasted charcoal bun! Try it yourself and I bet you're going to love it as I did too! If you haven't realized it yet, every burger fillings and patties were sandwiched between flavorful toasted charcoal buns and served with hand-made crispy sweet potato chips! Super love the crispy sweet potato chips! Nestle Bliss Supermarket Sweep Contest! AirAsia Red Hot Party with Taylor Swift! Fun In The Sun with Kiehl's!